Updated for 2018! When I think of Halloween, words like fun, costumes, and of course, candy come to mind, even decades after my trick or treating years have come to a close. But when it comes to special diets (dairy-free, vegan, gluten-free, nut-free, etc, etc, etc), which seem to be scarily common these days, Halloween treats can represent fear and envy more than sugary smiles. Fortunately, something special began to happen about a decade ago. 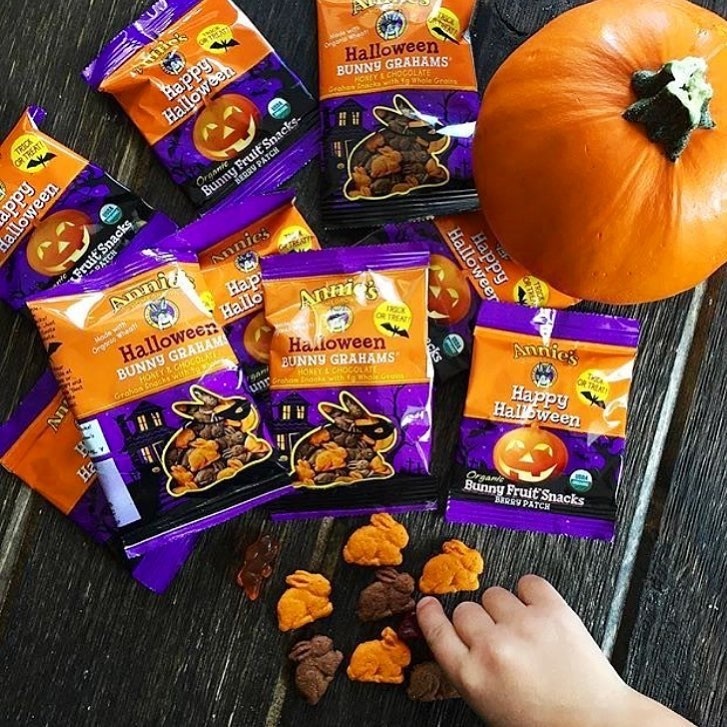 Companies popped up, one by one, offering sweets touted as “for everyone.” In 2006 I published an article called No Tricks, Real Treats for a Non-Dairy Halloween, followed in 2008 by Halloween Just Keeps Getting Yummier for Dairy-Free Kids. Things were starting to get interesting, but those lists were nothing compared to the goodies offered this year. We’re now up to twenty dairy-free and vegan Halloween treats (in no particular order) – all packaged for sharing. 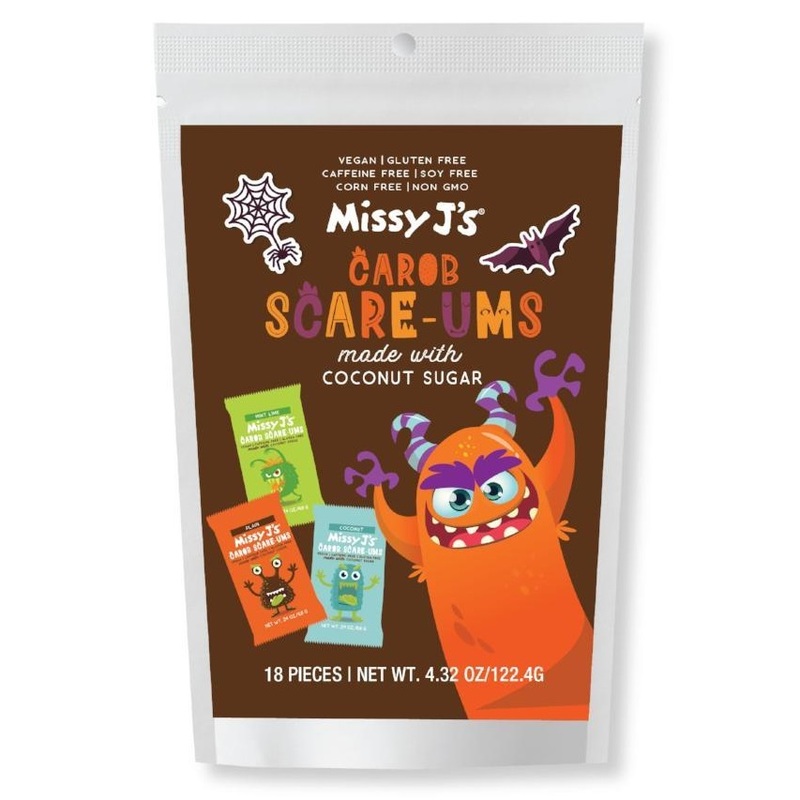 These include dairy-free Halloween chocolate, caramels, savory snacks, and some very cool candy option. 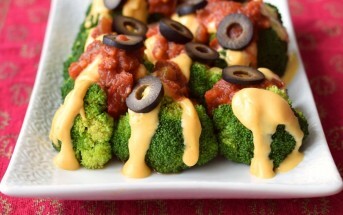 I’ve included links for ordering on Amazon or direct from the manufacturer, but many of these dairy-free and vegan Halloween treats are sold at stores like Whole Foods and Target. Please Note: For ALL of the following Halloween treats, always inquire with the manufacturer on ingredients and processes for allergen cross-contamination issues, particularly where severe food allergies are a concern. This is just our list of suggestions for items that were dairy ingredient free at the time of revew. Yes, there are dairy-free Halloween chocolates! These goodies are also vegan and some are allergy-friendly. Enjoy Life finally jumped into the Halloween treats trend. Two years ago they launched their Chocolate Chip Snack Packs, which are still available. But this year they’ve gone all the way with a whole range of Halloween-Themed Chocolate Bar Minis. You can choose between their Dark, Ricemilk, and Ricemilk Crunch Chocolate. “Milk” Chocolate AND White Chocolate, need I say more? Yes, there are a few dairy-free companies venturing into this territory now, but this was one of the first to produce such festive treats. This chocolatier is excellent for kids and those of us who have a sweet tooth. All of their chocolate veers toward sweet and milky rather than bitter and dark. Plus, No Whey is constantly coming out with cute new designs. 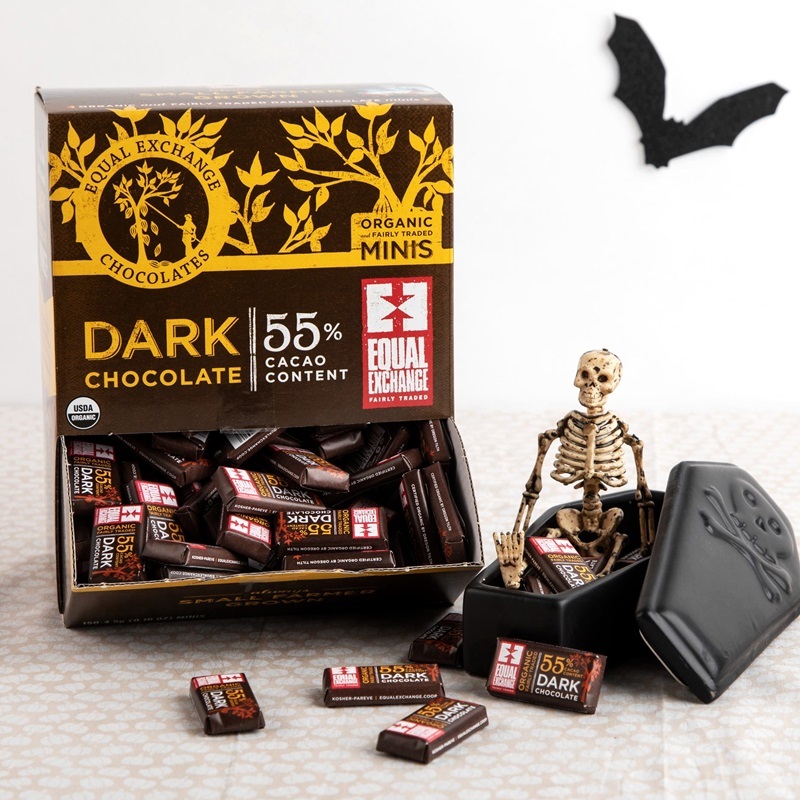 Their allergen-safe Halloween chocolate includes individually wrapped spider pops, skulls, mini chocolate bars, and even pumpkin truffles for mom. To Order: www.nowheychocolate.com or on Amazon. 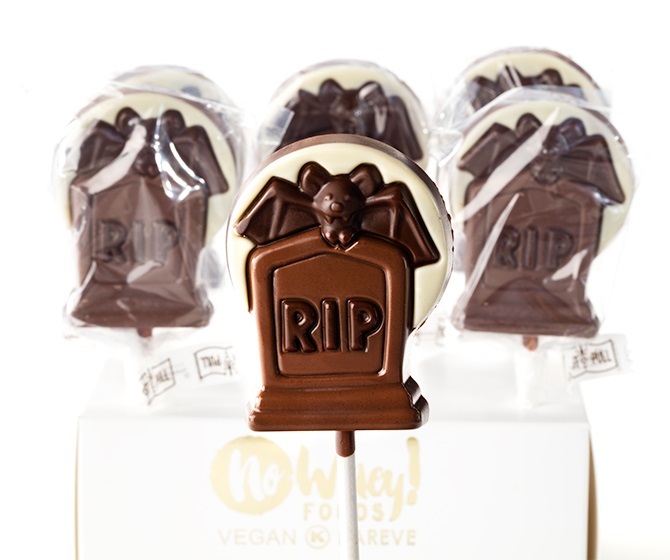 With an emphasis on cute and kid-friendly, this allergy-safe chocolatier makes bites and pops in all sorts of Halloween designs. They use dedicated equipment that is dairy-free, peanut-free, and tree nut-free, and are currently migrating to soy-free, too. Their infamous dark chocolate covered peanut butter cups are now sold in both single serve (2 full size cups) and bigger bags with individually-wrapped minis inside! Just use caution with severe milk allergies, and note that they do have a milk chocolate version of their peanut butter cups – stick to the dark for non-dairy. I am a big fan of Endangered Species, and love that they have these simple, yet Halloween appropriate, bite-sized dark chocolates. They’re great for handing out to kids or filling bowls at Halloween parties for kids. For adults, you might upgrade to their Dark Chocolate 88% Bites or Almond & Sea Salt Bites. Keep in mind that all of Endangered Species chocolate is run on shared lines (you can contact them about allergen protocols), so cross-contamination with the milk line is always a possibility. This is another chocolate love of mine. Sjaak’s offers their individually-wrapped peanut butter, orange, and pumpkin spice chocolate bites in cute Halloween bags or tubs (they sell out quickly though!). But, if those two flavors don’t spark you, they have several other individually-wrapped “bite” flavors to choose from. They just come in less Halloween-inspired colors. Keep in mind, all of Sjaak’s chocolate is run on shared lines (you can contact them about cleaning policies), so cross-contamination with the milk line could be a possibility. 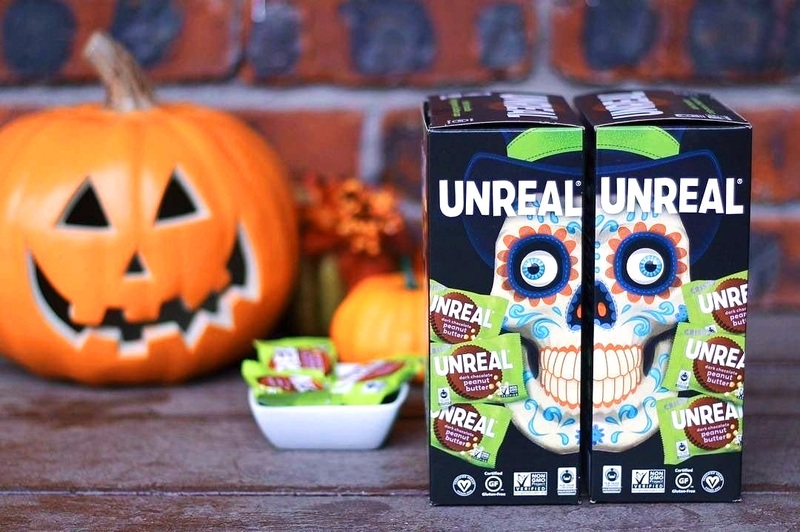 Unreal is a new fair trade, “natural,” chocolate candy bar company that has a whole vegan line, too. Some of their products use milk chocolate, but the dark chocolate cups and “gems” are made without dairy, and they have some fun Halloween packages of the cups! Oh OCHO! 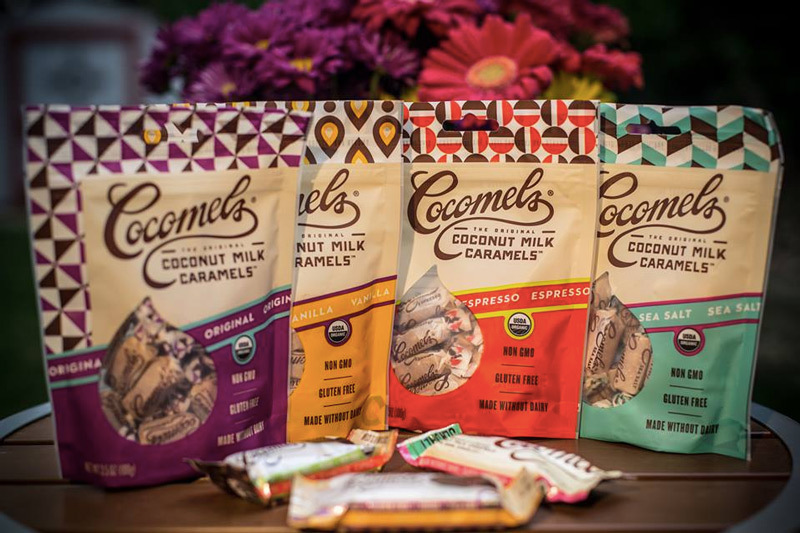 We’re hoping this brand comes out with more vegan flavors, as the Coconut Bars are delicious! I was happy to see that they now come in individually wrapped minis for Halloween sharing. Note that these mini bars are certified vegan, but they do make other chocolate bars that contain dairy and nuts. So it is best to check where severe food allergies or sensitivities are a concern. These bite-sized chocolates are made exclusively of pure, organic, fair trade chocolate, and without dairy and soy. However, they do have a potential cross-contamination warning for milk, peanuts, and tree nuts. I couldn’t be more excited! 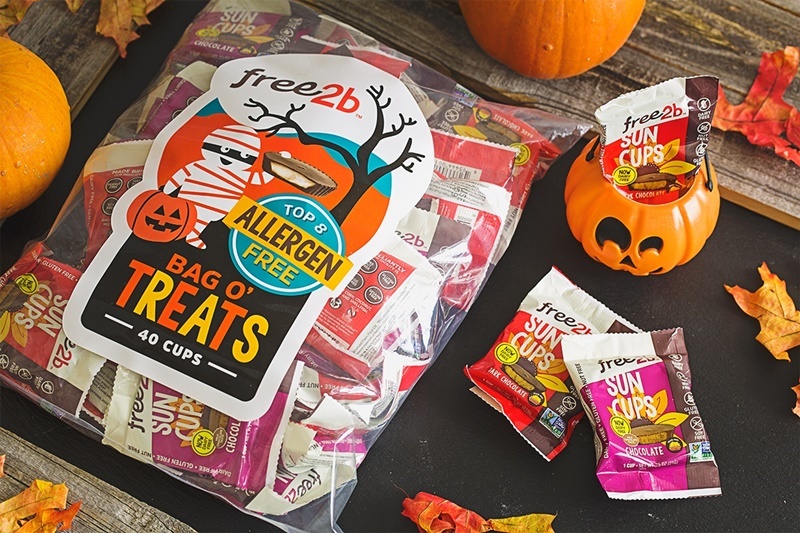 Free2b Sun Cups Bag O’ Treats is back! A couple of years ago, this brand went dairy-free, making them a top 8 allergen free manufacturer. These treats are like single pack Reese’s peanut butter cups, but without peanuts or dairy. They have a sunflower seed butter filling instead and come in (milky) Chocolate and Dark Chocolate. 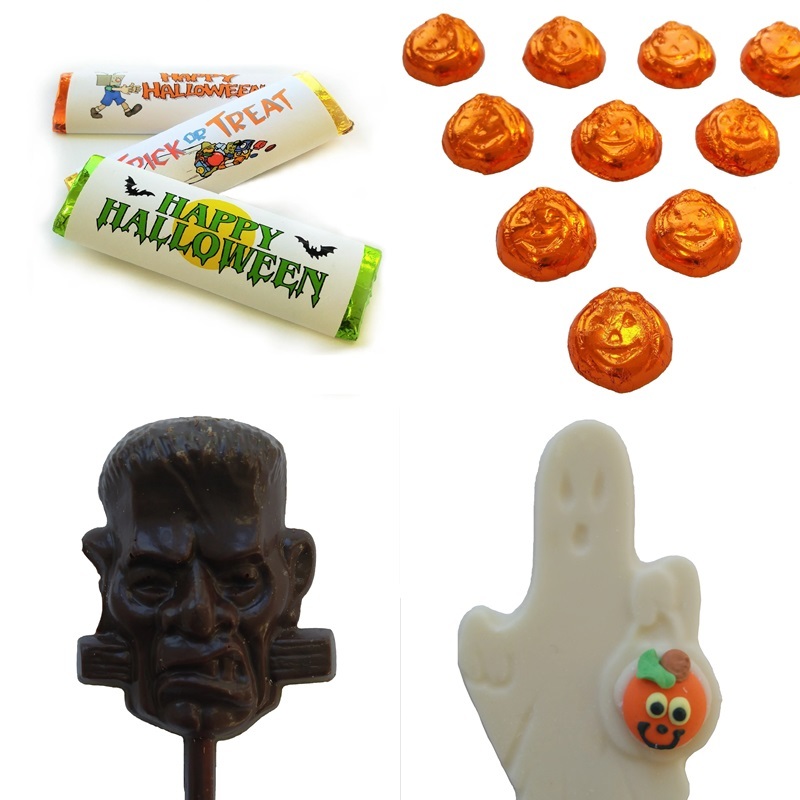 This beloved parve chocolatier is back with some kid-friendly chocolate bars and pops – they even have dairy-free white chocolate ghosts! But for sharing, the foil-wrapped chocolate pumpkins are the best value. Chocolate Emporium is billed as a kosher parve company, and they label their products as vegan, but like all food products, you must verify that they are safe for your needs. These are my top pick for cuteness this year. 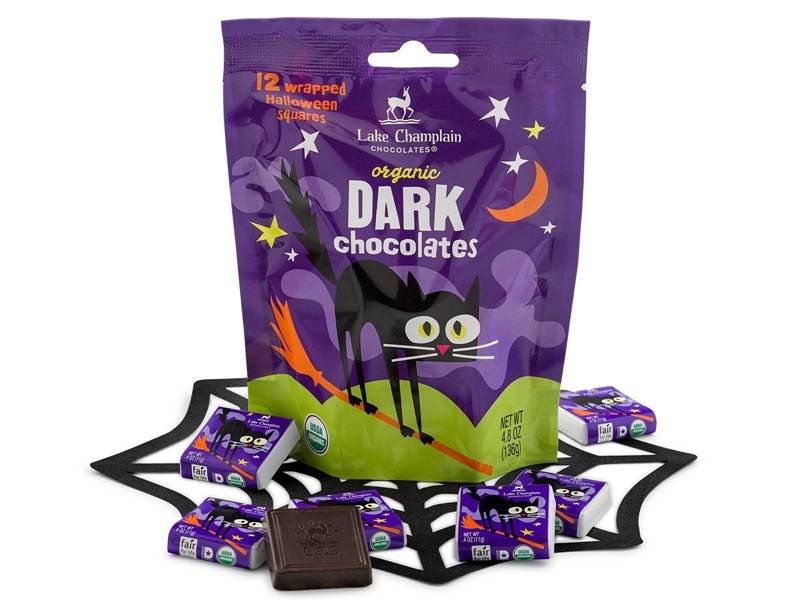 They’re “just” dark chocolate squares, but wrapped with an adorable scaredy cat on a broom image. Since they do make milk chocolate products too, these dark chocolates have a may contain warning for potential trace cross-contamination of milk, peanuts, soybean, tree nuts, and wheat. 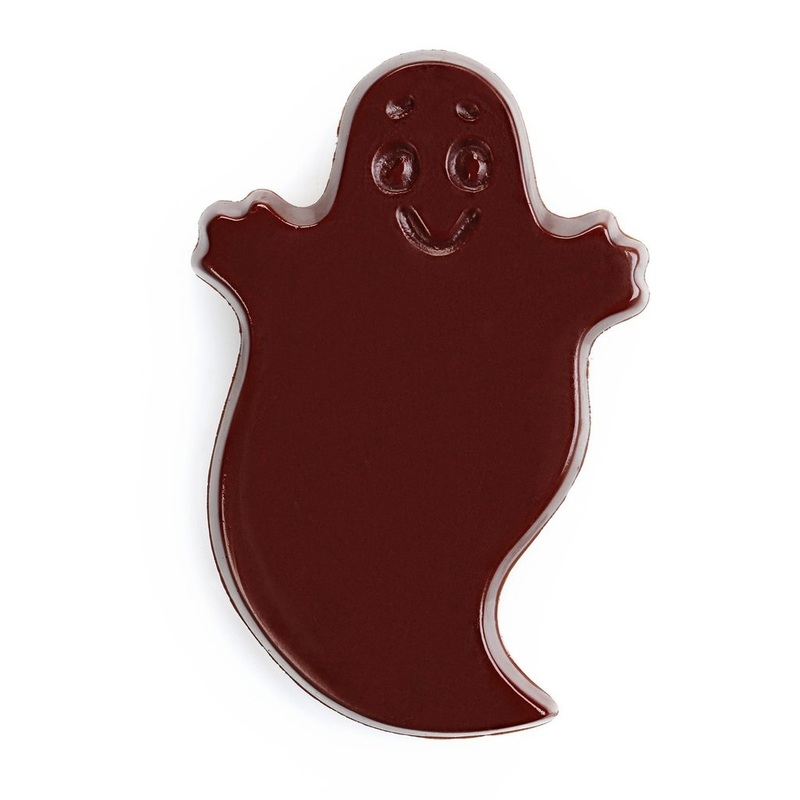 These are pricier treats, but I think your little one would gladly trade in several candy bars for just one of these ghosts. And they come with two per package! Like all Divvies goodies, this semi-sweet chocolate treat is vegan, dairy-free, and nut-free. It’s also gluten-free. Sure, there are quite a few candies that are naturally dairy-free by ingredients. But these are the cutest, tastiest, and most virtuous of the bunch. We’re talking organic and allergy-friendly options, and even dairy-free caramels! 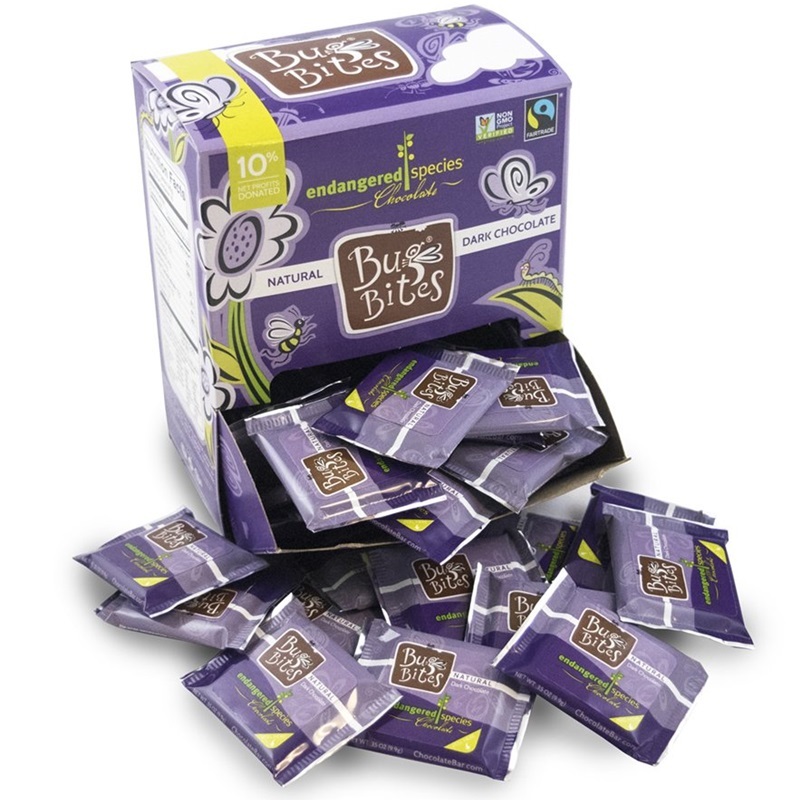 These sweet, individually-wrapped Cocomel caramels are organic, vegan, gluten free, corn syrup free, and soy free! They’re made with coconut milk and are seriously dreamy. 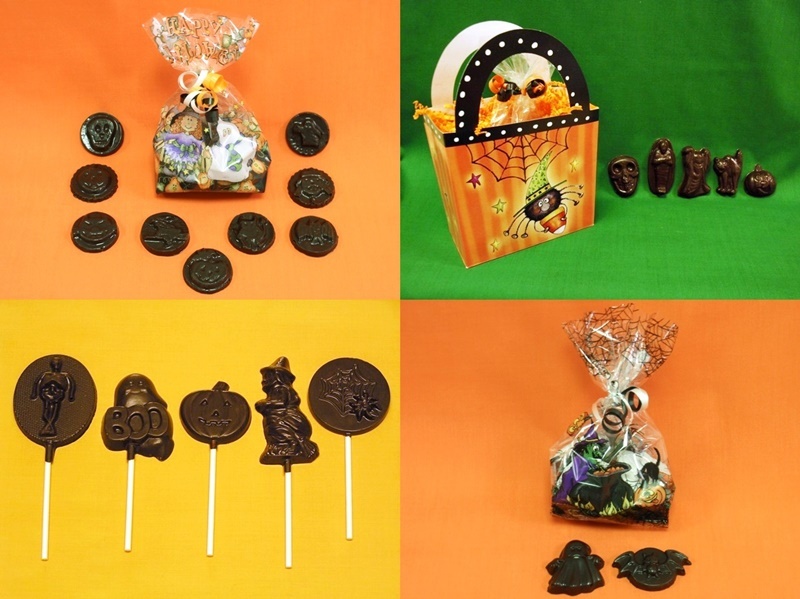 The packages come in a variety of flavors and sizes, so you can pick up a bag or a tub depending on how many little witches and pirates you’re expecting at your door! If you like to spend the big bucks on full-sized treat, then your dairy-free trick-or-treaters will really appreciate Chocolate-Covered Cocomels. To note, Cocomels are known as a dairy-free product, and the company has said they follow allergen protocols. But they are made on equipment that processes dairy, nuts, and soy. This yummilicious manufacturer deserves a mention around every holiday for a few reasons. One is their extremely allergen-friendly facility. Another is their individually-wrapped, bite-sized goodness. And finally, the ability to purchase jumbo bags of these all natural lollipops for an awesome price. 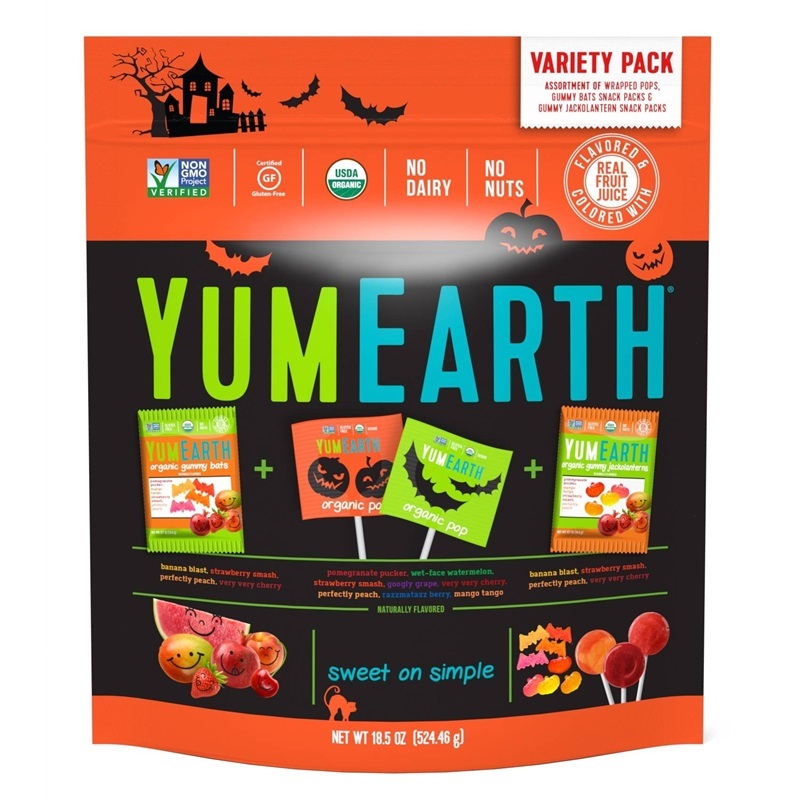 Beyond Halloween treats, if you need treats for tots, look no further than YumEarth (note that their gummies are dairy-free and allergy-friendly, but not vegan). Amazon frequently has specials on these lollipops, and they seem to ship quickly! And for Halloween this year, they also have gluten-free, nut-free, dairy-free Organic Candy Corn (it does contain egg). Surf Sweets was bought up by Wholesome Sweeteners, so you’ll now see their treats under both labels. 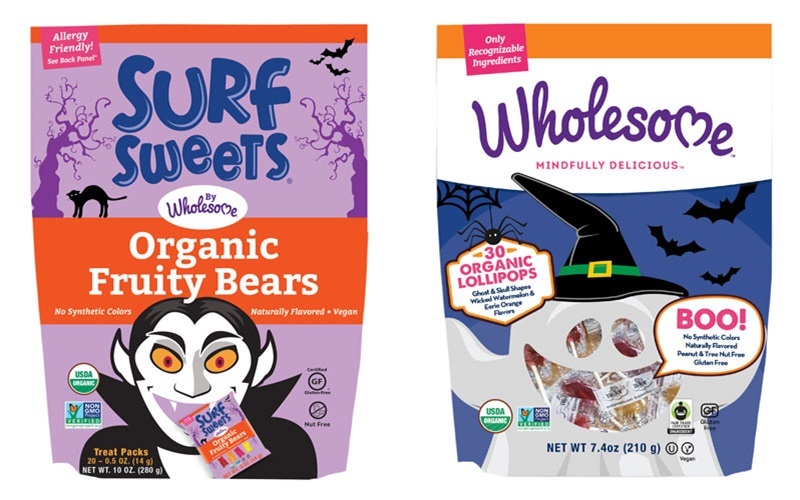 For Halloween they have organic gummies in treat packs that are not only top allergen-free, but also gelatin-free and vegan. 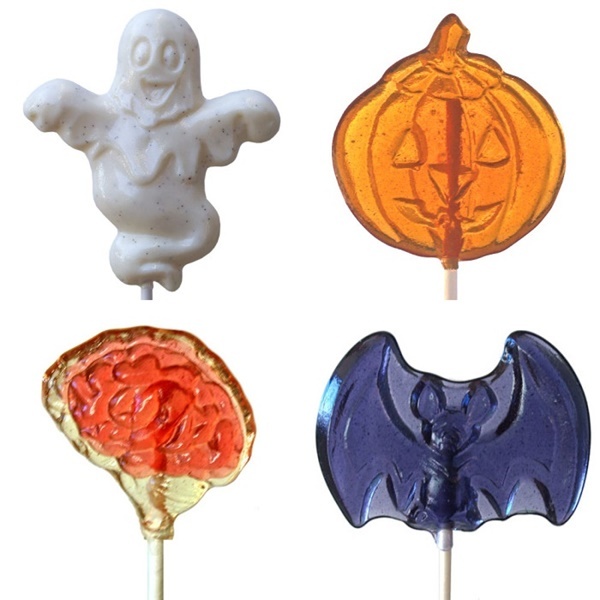 They also have a ghostly pack of their organic, naturally sweetened lollipops. I confess, I was never a bubble gum fan, but some of my friends couldn’t get enough of it. Perhaps there was something to my hesitation, since several brands of gum do contain just a wee bit of a milk-based ingredient. But not Glee Gum. 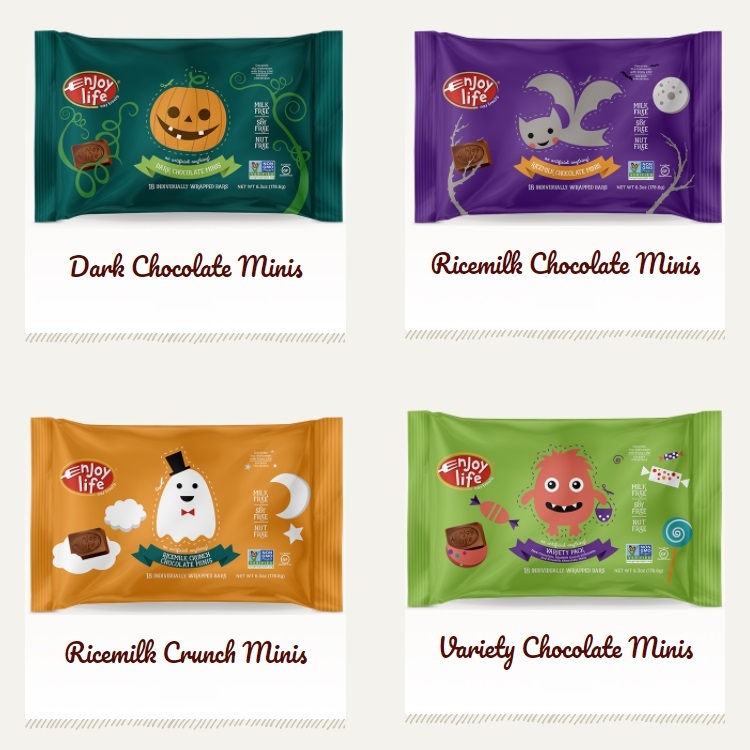 This allergy-friendly, “sustainable” brand comes in Halloween Gum Packs Minis (in an assortment of flavors) that are perfect for plunking into pumpkin baskets for low sugar Halloween treats. 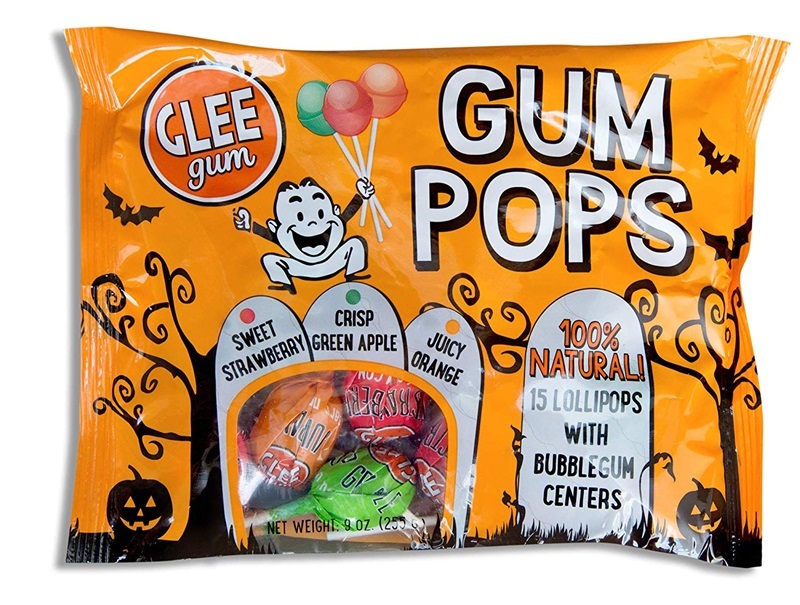 And, they have Gum Pops – in regular or Halloween packaging! This is one of my favorite sweet cheats. The flavors (d’anjou pear & cinnamon, blood orange & honey, pomegranate & nectarine, and pink grapefruit & honey) have grown-up appeal, but are a sweet treat for all. The candies are free of preservatives, additives, artificial flavoring, chemicals or dyes, and top allergens, and they are individually wrapped for sharing. It doesn’t look like they’ve brought the Halloween-themed bag back, but their individually-wrapped Hard Candies and Chewie Fruities are still cute and perfect for sharing. From adorable friendly ghosts to creepy brains, Strawberry Hill offers an array of fun designs and tasty flavors, all made in their top allergen-free facility (even corn-free!). Kind of a chocolate-candy hybrid, these vegan carob treats are sweetened with coconut sugar. They’re also made free of gluten, soy, and corn, and are naturally free of caffeine (unlike chocolate). If you’re little one likes carob, then this could be a great option for avoiding a hyperactive sugar rush. Most Black Forest candies and gummies are dairy-free, and made without top allergens. But several do contain gelatin, and therefore aren’t vegan. 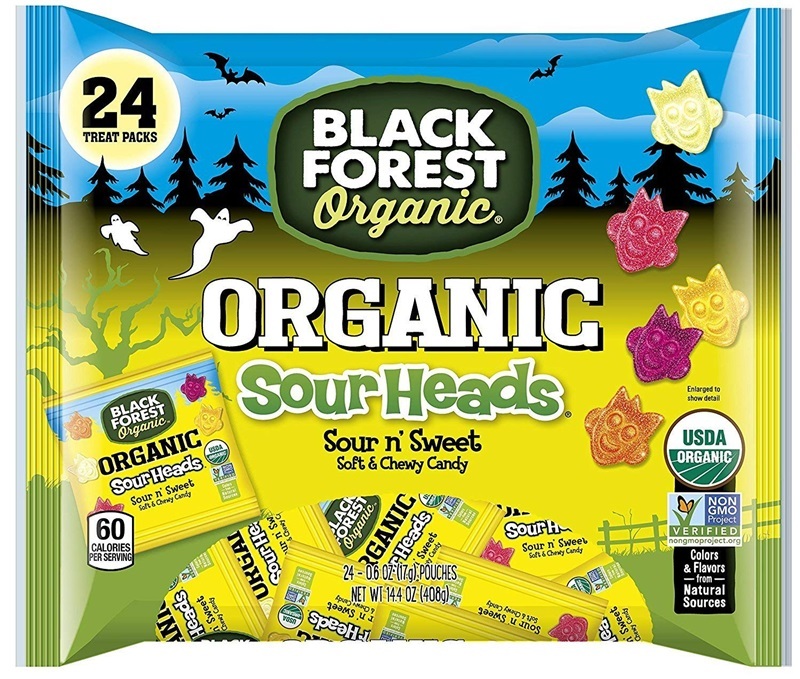 Luckily, one of their most popular treats is vegan and sold in Halloween packs: Sour Heads. 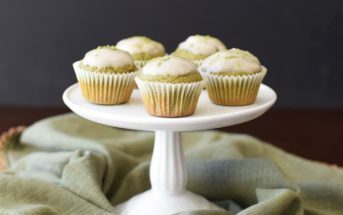 They’re also gluten-free and made without artificial flavors, colors, or other scary ingredients. This year, Annie’s is bringing back the Organic Bunnies & Bats Fruit Snacks, and they have new Organic Bunny Grahams Halloween Snacks. The Bunny Grahams do contain honey and wheat, so they are dairy-free, but not gluten-free or strictly vegan. What Cute Dairy-Free & Vegan Halloween Treats Do You Love? There is a local company in Connecticut that also has an online store for vegan and dairy free European chocolates that are AMAZING! Divine Treasures is the company, dtchocolates.com is their page. If you are local they even have soft serve “ice cream” that is to die for! I highly recommend them! Thanks for sharing this Tiffany! I love the Yum Earth Gummy Bears…I buy them for my daughter and then eat them all myself! Hi Karen, I completely understand how personal your concerns are, but there are two very important points to consider. One is that ALL products are at risk for cross-contamination. You can verify the fact that truly allergen-free is not possible in manufacturing with “allergen-free” companies. If I were to start only listing products “not at risk for cross-contamination” then it would be a serious liability position and I would be incorrect in many cases. 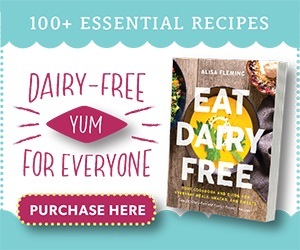 The second issue is that there are many degrees of allergen severity (many cell-mediated reaction are not as severely sensitive as IgE reactions can be and even not all IgE allergies are life-threatening) and most people who are dairy-free do not have to worry about potential trace amounts of milk via cross-contamination (lactose intolerant, health reasons, other types of health concerns). The unfortunate fact is that if an life-threatening allergy is a concern, then products must be personally evaluated (you can’t simply rely on a website to tell you what is safe, you MUST speak with the manufacturer to assess), cross-contamination should always be considered a risk, and products / processes can change at any time. I hope that you will enjoy the information, recipes, etc that I do provide for your informational purposes only. I have a wide audience to address, and do my best!!!! Thanks for your very informed reply! 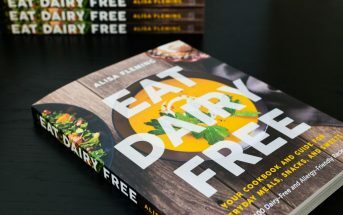 I love your website and understand; I just get frustrated when I go to find dairy free products that have small print that seems misleading to the dairy free or vegan labeling! Keep in mind that the “may contains” or “made in a facility with” are very voluntary – some products with “may contain milk” on them are actually safer than ones without that. Many without it are still at risk for cross-contamination – they just don’t disclaim it. Always best to call! An allergy mom (her daughter is anaphylaxis to milk) who works with me does by some of the products that are “made in a facility with milk” as she has verified them safe. Also, it depends on the type of milk used in the facility (liquid cross-contamination is less likely, but milk powder can “float”). Glad I can help! Just an FYI Justins dark chocolate peanut butter cups now say they have milk in them. Contains: Peanuts, Soy, Tree Nuts, Milk. They state :Even though there are no milk ingredients added to our delicious Dark Chocolate Peanut Butter Cups and the recipe has not changed, we recently changed our label to indicate “contains milk” because they are produced on machinery that also processes our Milk Chocolate Peanut Butter Cups and White Chocolate Peanut Butter Cups, which do contain milk. Justin’s peanut butter cups are NOT dairy free anymore. It seems SOME of them are listed as such, but on the whole, they have milk in them now and carry the hechsher stamp U-D to prove it. 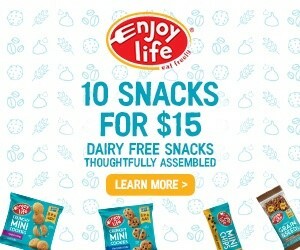 So very sad for me, as that used to be my go-to for dairy free chocolate to hand out (and eat). 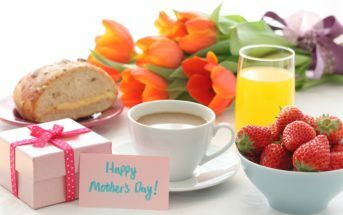 I used Chocolate Emporium’s website choclat.com (yes, that’s the spelling) for every holiday (Christmas, Easter, Halloween, St. Valentine’s Day, etc.) for many years for my cow’s milk allergic daughter. She has since grown out of the allergy. They were a LIFESAVER. She didn’t feel deprived at all she assures me now that she’s a teen, in fact she misses them because they tasted so good and were so cute. Hi Kay, they went out of business, and I believe are back now? The only problem is that when I go to their site, it’s got a virus / malware, so I’m hesitant on sending people there. 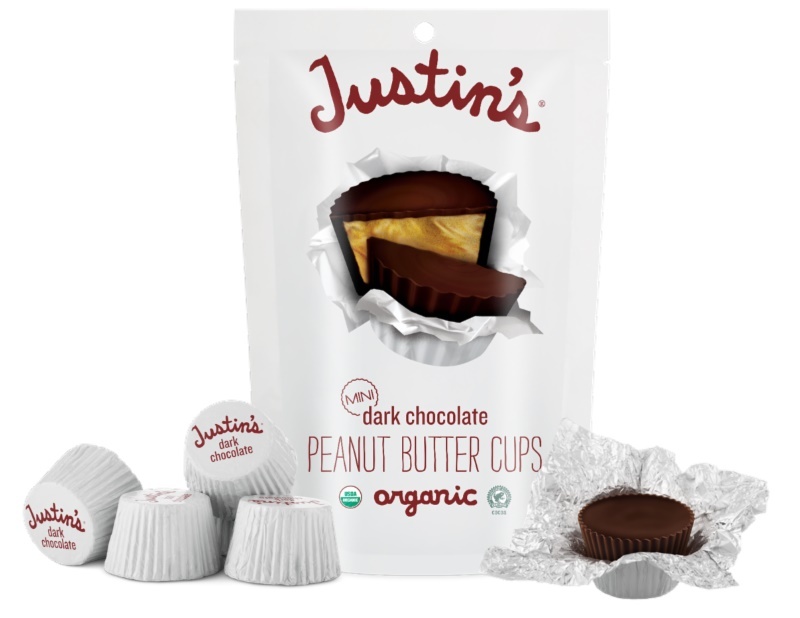 Justin’s Dark Chocolate Peanut Butter Cups have removed the “vegan” labeling from the cups and have added milk to the “Contains:” allergy section, due to likelihood of cross-contamination. 🙁 I wish they were made separate from the milk cups, so that they could be a safe food. Why does my Dark Chocolate Peanut Butter Cup say “Contains Milk” when there are no milk products in the ingredients? Although we do not use any milk ingredients in our Dark Chocolate Peanut Butter Cups, they are produced on machinery that also manufactures our Milk Chocolate Peanut Butter Cups, which do contain milk. We use the phrase “Contains Milk” as a precautionary measure for those who are sensitive to milk allergies. To minimize confusion with the milk allergen statement, we also removed the “Vegan” label that you may have seen on pack in the past. So there is no milk in the ingredients, but it is just for cross-contamination? I wish companies wouldn’t do that – it creates so much more confusion! Most products are at risk for cross-contamination (including many that are labeled vegan) and not safe for severe food allergies – those should have a “may contain” warning, not a contains warning – argh! Thanks for the update Brandi. The marshmallow treats are so cute!! BTW – I found the perfect Vegan wine to pair with the Halloween’s sweets -the Deccolio Prosecco, I bought it in Whole Foods Market (it’s in their top 10)!! ooh, I’ll have to check that out – thanks Gidon! Hi Jenna, yes, you are correct, those are not, but their other treats are! I don’t state that every item they sell is vegan, just that they do cater to vegan with options that I’m sure you’ll love! Have you tried their candies and the lollipops pictured – yum!! Oh man, Justin’s pb cups and some Scaredy Cats and I’m a happy girl! My kids would LOVE those cats! FYI- Glee Gum is not vegan as it contains beeswax. Bummer because I love all the other ingredients. Thanks for noting this Kimberly. Good news though – their glee gum kits (make your own gum!) do not contain beeswax. I could never buy Halloween treats that are THIS amazing because 1) We would be lucky to get a half dozen trick-or-treaters, and 2) There’s no chance that a scrap of it would be left by evening. I can’t possibly restrain myself if there are rarities like vegan marshmallows, caramels, or candy bars in the house!